This is arguably one of the most anticipated sets of last year. 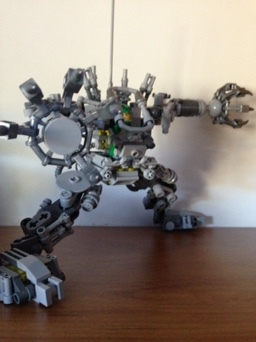 The Exo-Suit is one of those special LEGO Ideas/Cuusoo sets that isn’t based on something that already exists. So far, out of the 10 sets released, 3 are original ideas (this one, 21110: Research Institute, and 21301: Birds). For those of you playing at home, the rest include the Shinkai 6500 manned submersible, the Hayabusa unmanned spacecraft, Minecraft Micro World, Back to the Future DeLorean, Curiosity Rover, Ghostbusters car, and the recently approved The Big Bang Theory. There was so much hype with this set, it was hard not to get caught up in it. To me though, the hype was justified. The original designer of this set, Peter Reid, is well known for his space builds, so it’s pretty exciting to see! Normally I wouldn’t mention the packaging, but in this case I will. The Exo-Suit comes in a really nice hinge-topped box with images on the front and back depicting the Exo-Suit, the M364 Turtle, and Yve, with Pete driving the Exo-Suit. Inside the box are 4 small bags of parts, an 8×8 Grid Plate, a Flex Hose, and a very nicely bound instruction booklet. The booklet is a little deceptive. It’s quite thick, but most of it is a story about the project, repeated in different languages. This set includes a large number of parts that are rarely seen, or haven’t been seen before at all. 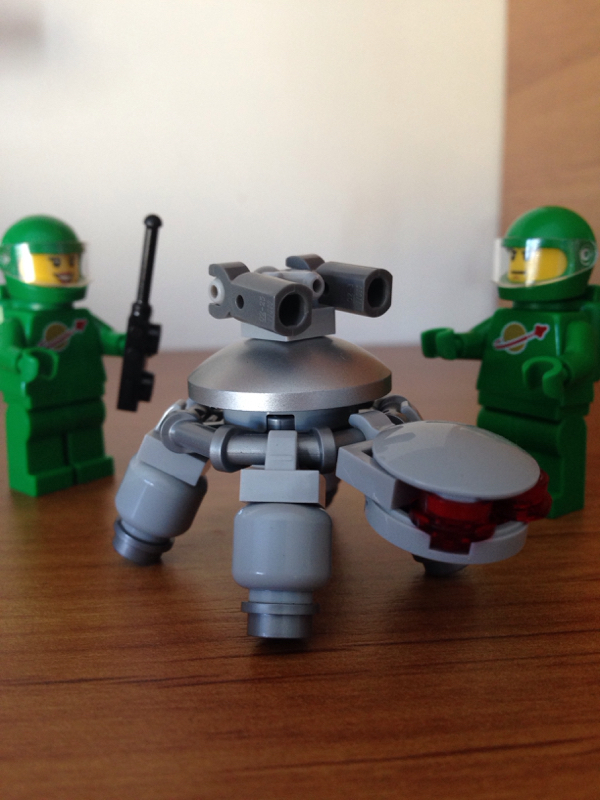 First and foremost, this is the first set to release the spaceman minifigure in green! Other parts unique to this set are the 2×2 Inverted Dome in medium stone grey, and the silver metal Hub Cap. There are also a couple of Disks, a yellow 2×2 round flat tile, and a printed flat 2×2 tile. It looks like a jet booster or engine. This piece is also available on a couple of Legends of Chima sets, but that’s it. 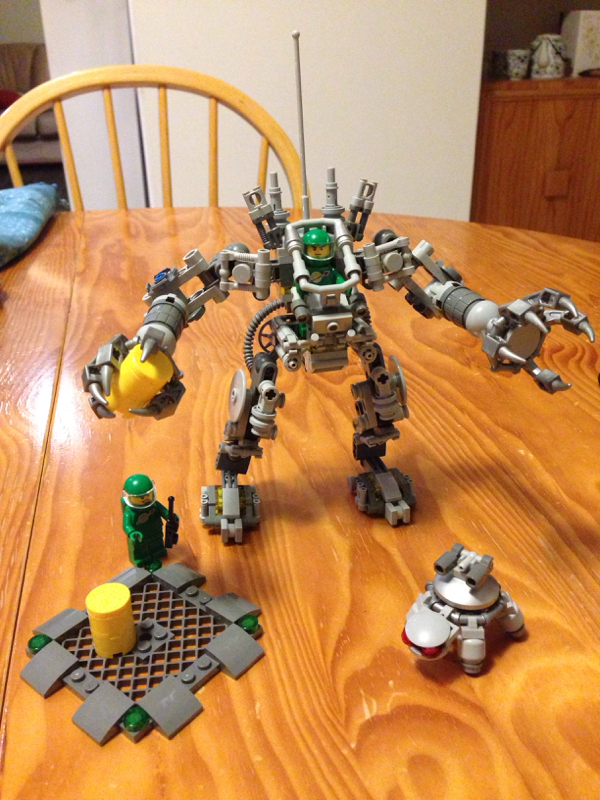 This set also has a fair few extra parts, including a visor, green minifigure air tanks, and more. Incredibly, most of this set is made up of tiny parts! Aside from the grill plate and flex tube, and a couple of other small plates, everything else is very small – it made for a slightly slower build rate. 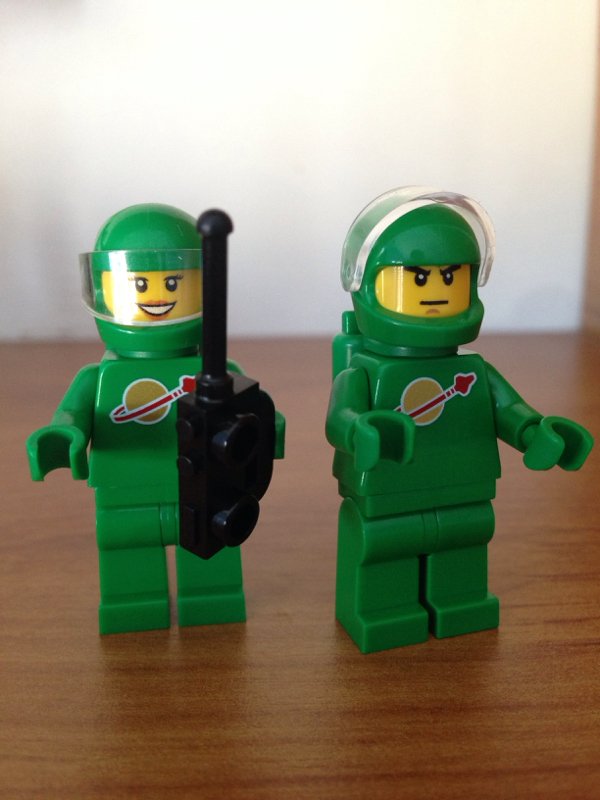 The minifigures are 2 simple spacemen, only green! And one is a female. Pete and Yve are our intrepid explorers, who happen to stumble upon a base with the Exo-Suits in storage. There’s nothing particularly interesting about these two – no reversible faces or special prints on the parts, just simple! 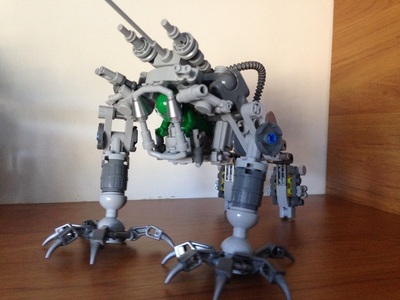 Along with Pete, Yve and the Exo-Suit is the M364 Turtle. 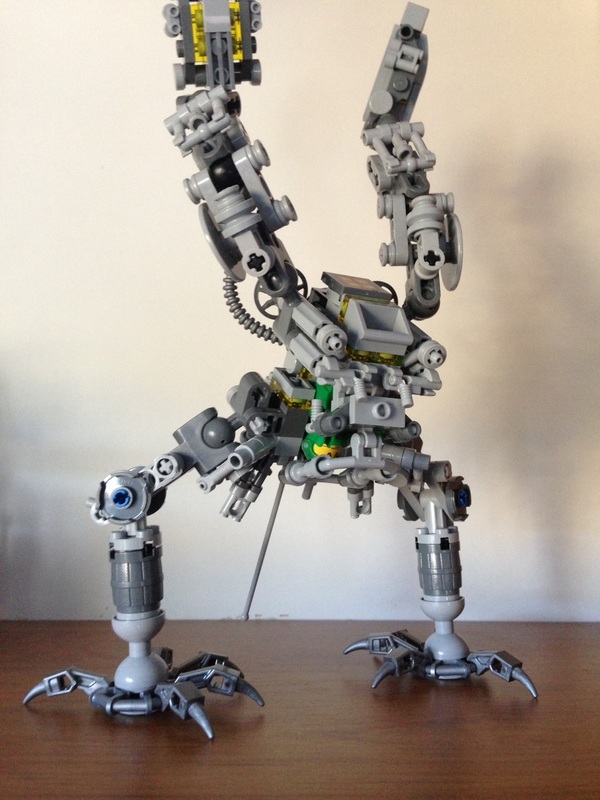 This little guy is a standard sight in Peter’s builds, and it’s great to see one included. He’s even created some more insane weapon varieties. Check out the original image on Flickr, or this article from New Elementary! One of the coolest parts of the turtle are the grey minifigure heads used for the legs. As I mentioned before, the build for this was a little fiddly, but still thoroughly enjoyable. 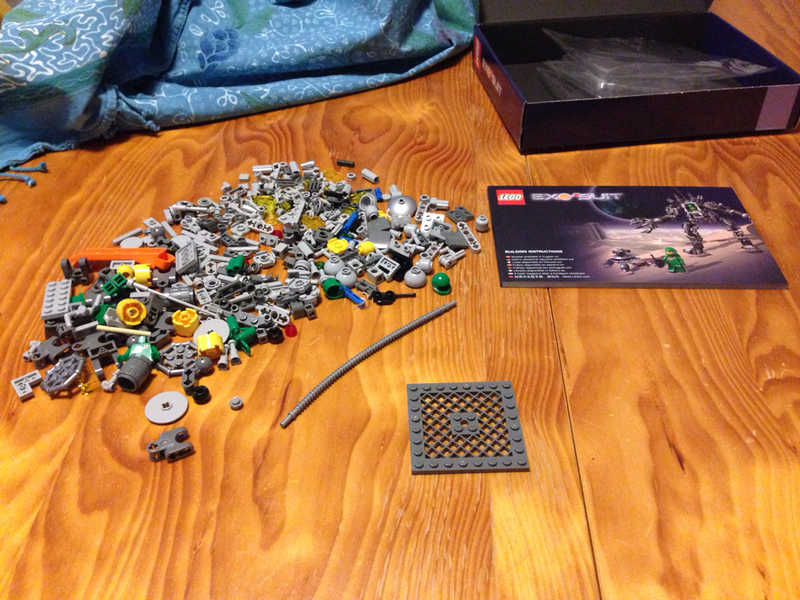 I’ve been after this set for a while, so I was super excited to start building it. It’s interesting to note the changes from the original design. LEGO Senior Designer Mark Stafford redesigned it, at the request of Peter. By the looks of this image, the set has been bulked up a bit, and the different colours are a definite boost. It adds a lot more texture to the model. I’m still not sure what to think about the barrels in the arms, but the rest is awesome. The hub caps in the back, with the flex tube make it look really cool, and just the fact that it’s taller makes it look much more imposing. A couple of times a few of the smaller parts have fallen off while moving it, but it’s a very small issue. Overall, I am super impressed with this model. It’s everything I thought it would be, and more. It’s one I will be keeping built for a very long time! 9.5 green spacemen out of 10! Next review: it’s a big one – 10241: Maersk Line Triple-E. Container ship time!